"Om Kaalakaalaaya Vidhmahey Kaalaatheethaaya Dheemahi Thanno Kaala Bhairava Prachodhayaath"
The above is the Gayatri Mantra of Lord Bhairava, also commonly referred to as Kaala Bhairava, who is a frightful aspect of Maheshwara (Shiva). The Trinity of Hindu Gods, that is, Brahma, Vishnu and Shiva, are associated with Creation, Preservation and Destruction, respectively. Bhairava, the rather fierce manifestation of Lord Shiva, is commonly associated with this aspect of annihilation. Originating in ancient Hindu legends, the much-feared form of Bhairava is revered by Hindus, Jains and Buddhists alike. He is also worshipped in this form throughout India and Nepal. All these Bhairavas are controlled by Maha Swarna Kala Bhairava, also known as Kaala Bhairava. He is the Supreme Godhead and the ruler of the rest of the Bhairavas. Kaala Bhairava's consort is Bhairavi, the terrible aspect of Parvati, or Kali. This frightful aspect of the Lord is predominantly worshipped by the Aghora sect. Residents of Kashmir, who have their origin from Gorat, worship Bhairava during the festival of Shivaratri. While the name itself may translate into "terrible" and "fearful", the actual interpretation is quite different. It means he is the Lord who protects his devotees from external enemies; as also from internal enemies such as greed, lust, anger and all other negative emotions. There is yet another interpretation of the name "Bhairava". "Bha" stands for creation, "Ra" for preservation and "Va" for destruction. Bhairava, thus, is believed to be the Ultimate Godhead, combines all of these forces of the Universe. There are several legends surrounding Bhairava, the Dark and Frightful Aspect of Shiva. According to the most popular legend, which features in the Shiva Mahapurana, there was once a debate between Brahma, Vishnu and Shiva. Vishnu asked Brahma who the Supreme Creator of the Universe was. Brahma became a little egoistic, as he was always celebrated as the Creator. 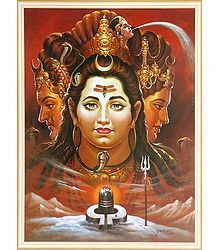 Furthermore, he thought that since he too had 5 heads like Shiva, he could achieve anything that Shiva could. He then began to forge the work of Shiva and started interfering with Shiva's daily duties. Shiva observed all this patiently for some time. Later, when he could take it no more, he removed a small nail from his finger and threw it. This nail assumed the form of Kaala Bhairava. The manifestation headed straight for Brahma and chopped one of his heads off. Bhairava is always shown holding the skull of Brahma in his hands. Bhairava's action completely subdued and humbled Brahma; destroying his ego and bestowing instant enlightenment upon him. He was deeply grateful to Bhairava and, prostrating before him, promised to work only for the benefit of the Universe, from then on. According to another legend, Shiva himself created Bhairava. There was a terrible demon named Dahurasuran. After severe penance, he got a boon that he could be killed only by a woman. Parvati then took the form of Kali to slay him. After fulfilling her mission, her wrath took the form of a child. Kali fed her child with her milk. Seeing all this, Shiva emerged there and made both Kali and the child to merge into him. From this form of Bhairava, Shiva appeared in all his eight manifestations of Ashtanga Bhairavas. Since Shiva gave rise to Bhairava, the latter is sometimes referred to as his son. The Puranas give yet another version of Bhairava's origin. According to this legend, there was once a war between Gods and demons. In order to destroy all the demons, Shiva created Kaala Bhairava. The Ashtanga Bhairavas who were created from him eventually went on to marry the Ashta Matrikas. All these manifestations have terrible forms. From the Ashtanga Bhairavas and Ashta Matrikas were created the 64 Bhairavas and 64 Yoginis. A modified version of the original legend goes as follows. When Brahma insulted Shiva, the latter took the form of the angry Bhairava. He jumped out from Shiva's Third Eye and severed Brahma's head. Brahma's head then got stuck to Bhairava's left palm. This was Bhairava's punishment for severing the most sacred and learned Brahmin's head. In order to atone for the greatest sin of Brahmahatya, Bhairava took a vow to wander around as a naked beggar, with the skull as his begging bowl. He is finally liberated of his sin when he reaches the holy city of Varanasi. There is still a temple dedicated to Bhairava's worship in this city. Usually, one can easily find Bhairava idols in all Shiva temples. These idols are located in the north-facing and south-facing directions. Bhairava is generally depicted in a standing position, with four hands. He holds a drum, a paasa (noose), trident and skull. Some forms of Bhairava depict more than four hands. He is normally shown as digambara (without clothing - encompassing the entire space within himself). 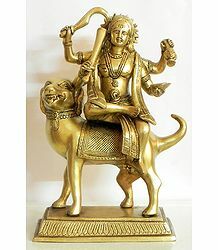 Bhairava's vahana (vehicle) is Shwaswa, the dog. This animal appears terrifying too, with protruding teeth and a menacing expression. Feeding and caring for dogs is considered to be an apt way of showing one's devotion and dedication to Lord Kaala Bhairava. He is also portrayed as being ornamented with several twisted serpents, which serve as his earrings, bracelets, necklaces, anklets, armlets and yagnopavita (sacred thread). He wears tiger skin around his waist and a sort of apron, made of human bones. Shaivites consider Bhairava to be the Protector, as he guards the 8 directions. He is also regarded as the protector of women (especially those who are timid in nature). All Shiva temples have a Bhairava idol. The keys to the temple are placed before this deity, as it is believed that he will protect the premises even when the temple is closed for the day - this is why he is also referred to as Kshetrapalaka or the Guardian of the Temple. This avatar of the Lord is also venerated as the Guardian of Travelers. He is believed to guard all those who take his name during long-distance travel - he especially protects those who undertake travel at night. To attain his grace, it is prescribed that you should create a garland of cashew nuts and offer it to his idol. You should also light a lamp and sincerely pray to him for protection during your travel. Kaala Bhairava is considered to be the Guru of Shani (planet Saturn). 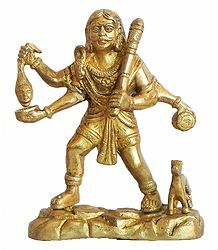 Also referred to as Bhairavar or Vairavar (in Tamil Nadu), he is often portrayed as a Grama Devata or Village Guardian, who safeguards both the village and its residents from threat that could arise from any of the eight directions. He is also venerated by the residents of Sri Lanka. In Singhalese, he is referred to as Bahirawa. There too, he is venerated as the Guardian of Treasures. It is believed that worshipping Bhairava gives the devotee peace, prosperity, success and progeny. The powerful God is also believed to protect his devotees from premature death, sadness, tragedy and debt. One can find temples or shrines dedicated to Bhairava, near most of the Jyotirlinga temples. These are the twelve most sacred shrines dedicated to the worship of Lord Shiva. These temples are scattered all over India, including the Kaal Bhairav Temple at Ujjain, the Kasi Vishwanath Temple at Varanasi and the Patal Bhairav and Vikrant Bhairav shrines at Ujjain. In all Shiva temples, daily puja rituals begin with offering worship to Surya or the Sun God. It then ends with worshipping Bhairava. Bhairava is offered a ghee abhishek (holy bath ritual), ghee lamps, red flowers, whole coconuts, honey, boiled food, fruits and eight types of flowers and leaves. A Bhairava idol facing west is a good sign. If it is facing south, it is moderate. A Bhairava facing east is not considered to be appropriate. Also, the best time to offer prayers to this Lord is at midnight; especially on Friday night. It is believed that, at this time, he and his consort Bhairavi will shower grace on their devotees and grant them their darshan as well. It is believed that the five of the eight Bhairavas represent the five elements of air, fire, water, earth and ether. The three others are the sun, moon and the atman (consciousness). Each of these eight manifestations is different in appearance and wields different weapons, have different vahanas (vehicles) and bless their devotees with eight different types of wealth, represent the Ashta Lakshmis. The mantra to invoke each of these manifestations is also different. Bhairava is considered to be the ultimate form for attaining liberation. He is the One that grants the awareness of pure consciousness. This form is called the Svarpaakarsna Bhairava. He is depicted as a glowing red in complexion and drapes a golden dress around himself. Holding the moon in his head, he has four hands. He is the giver of wealth and prosperity. Followers believe that praying to this form on Tuesdays, grants them immediate and effective results. Some texts describe him as having thirty-two hands, golden complexion, terrible teeth and the shape of a bird. He is shown having a human form above the hip. It is said that worshipping him helps his devotees destroy their enemies. Bhairava Ashtami, also called Kaalaashtami, Kaala Bhairava Ashtami, Kaala Bhairava Jayanti, Bhairavashtami and Bhairava Jayanti, is a sacred day, commemorating the birth of Lord Bhairava. This event falls on the eight lunar day in the Krishna Paksha (fortnight of the waning moon) of the Hindu month of Kartik (November-December). During this period, the Lord, in the form of Dandapani, rides on his dog. 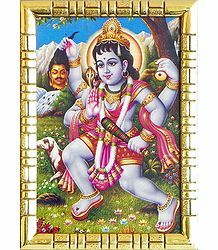 He is called Dandapani, as he wields a Danda or rod, to punish sinners. Devotees keep an all-night vigil on the night of Bhairava Ashtami, praying and singing the praises of their Lord. An elaborate midnight arati is performed with devotees blowing conches, playing drums and cymbals. After a bath the next morning, devotees offer obeisance to their deceased kin. Then Bhairava is worshipped along with Bhairavi and his Dog. Followers offer flowers, milk, curds and sweets to the idols. This day is considered even more sacred if it falls on a Sunday or a Tuesday. This day is celebrated with great fervor at the Bhairav Prasad temple in the Vaishno Devi hills in Kashmir. 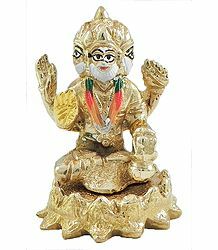 An idol of the Lord is made in silver or gold and is immersed in a brass metal pot, filled with water. Then priests offer pujas and prayers, before distributing prasad to all gathered there. In Varanasi, devotees undertake an eight-day pilgrimage to the eight temple of Ashta Bhairava. This journey is undertaken on the first eight days of the fortnight, ending with the Bhairava Ashtami. The deity is generally covered with a cloth (with only the face showing) the whole year round. But on this day, the cloth is removed to reveal the entire idol. His image is decorated with a garland of silver skulls. Devotees throng the temple in order to catch a glimpse of the powerful God. In the Indian state of Karnataka, Lord Kaalabhairaveshwara is revered as the Kshetrapalaka of the Sri Adichunchanagiri Math. The Gowdas of this region adore him as the Supreme Godhead. Those belonging to the Gangadikara Gowda caste consider him as the caretaker and punisher. The Sri Kaala Bhairava Nath Swami temple in Madhya Pradesh is yet another famous temple dedicated to the worship of this manifestation of Shiva. Bhairava is one of the most important deities of the Newars in Nepal. Most settlements there have at least one temple of the Lord. Also, the Bhairava temples in that country are mostly maintained by Newar priests. Temples of Kaala Bhairava can be predominantly found around the Shakti Peethas. It is believed that Shiva allocated each Bhairava to guard one of the 52 Shakti Peethas. The Shakti Peethas are holy places of worship, dedicated to Goddess Shakti, the main female deity of Hinduism and the principal deity of the Shaktya sect. Goddess Shakti is often associated with harmony, peace, prosperity, longevity, strength, marital felicity and destruction of evil. The 52 Shakti Peethas can be found scattered all over the Indian subcontinent. According to legend, during the Satya Yuga, King Daksha (the son of Lord Brahma) performed a Vrihaspati yagna, with intent to take revenge on Lord Shiva. His most favorite daughter, Sati, had fallen in love with Shiva and had married him against his wishes. He was a staunch Vaishnavite (follower of Vishnu) and detested Shiva. He had tried everything to stop Sati from marrying Shiva, but had failed miserably. Daksha invited all the deities to the yagna, but decided to ignore Sati and Shiva. Though Sati was upset at not being invited for the event, she wanted to attend it, as it was her family function. When she expressed her desire to Shiva, he tried his best to dissuade her from going there. However, she was insistent that she wanted to attend the yagna. Shiva eventually relented and acceded to her request. Sati left for her parental home, escorted by Shiva's ganas. When Sati reached the site of the yagna, Daksha refused to even acknowledge her and insulted her and Shiva. Unable to bear her father's insulting words against her husband, she committed suicide by jumping into the sacrificial fire. When Shiva came to know about this, he was furious. He, along with his ganas, went to the site of the yagna and completely destroyed it. He then cut off the head of the arrogant Daksha. 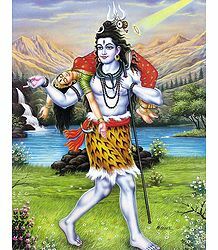 Still in a state of uncontrollable grief and fury, Shiva carried the corpse of Sati on his shoulder and performed his terrible Tandava dance. Unable to stand the extent of his fury, the three worlds went into a state of turmoil. The Gods went to Vishnu, beseeching him to somehow control Shiva's anger. Vishnu appeared before Shiva, took Sati's lifeless body and severed it into many pieces, with the help of his Sudarshana Chakra (Discus). The pieces of her body fell at various places throughout India. They then came to be known as the sacred Shakti Peethas. In each of the Shakti Peethas, both the presiding Goddess and the Bhairava guarding her temple are given a particular name. Bhairava encompasses the entire universe within himself; all the Shaktis seamlessly merging into him; becoming one with him. In Tantra, Bhairava is both an aspect of Shiva and a supremely divine mantra, capable of transporting the seeker into the highest realms of consciousness. The Vijnana-Bhairava is one of the most important tantric treatises. Similarly, the Bhairavamudra is one of the most crucial mudras (gestures) in tantra. This mudra, which is complicated and is a difficult state to achieve, is revealed only to a few sadhaks. When Shiva completely withdraws into himself and immerses himself in his own consciousness, he rises in the awareness of being one with Kali. 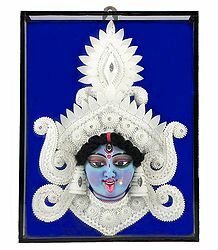 Thus emerges the form of Bhairava, the masculine aspect of Kali herself, who manifests as Bhairavi. This union of the potent male and female energies in the universe lacks any intrinsic qualities - it is pure, effulgent light. The thing to note here is that the dark, evil-looking intensity depicted in the forms of Bhairava and Bhairavi do not actually imply evil intent. The very nature of Bhairava is to look inward and not outward. Shiva, in his state of intense meditation, goes on an inward journey; eventually experiencing his existence within the womb of Kali, who manifests as Bhairavi. From this dark abyss arises the terrible form of Bhairava. Similarly, the Bhairava-Bhairavi union aims to educate the seeker to defy the dark forces of evil, ignorance and violence; journey into himself; understand that he comes from within the womb of the Universal Mother, Kali; then finally transform himself to emerge as powerful pure energy, which can help serve humanity in ways he could otherwise not even imagine possible. Seen from this perspective, Bhairava or Mahakala is a tantric deity, which symbolizes an internalizing, holistic, healing force, which helps a sadhak towards self-fulfillment and actualization of desires. The energy of Bhairava emerges as a driving force, which overcomes every obstacle to achieve all that it seeks. It is therefore seen as "destructive" - that which destroys everything which comes in the way of its own fulfillment. Kaalabhairava Ashtakam is a beautiful Sanskrit hymn, composed by Adi Shankara. It comprises eight stanzas; which are typical of any Ashtakam. 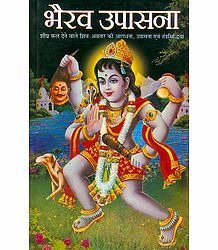 The hymn depicts the qualities of Kaala Bhairava of Kashi, the God of Death. This Bhairava is described as being black; without clothing; terrible-looking with protruding fangs; ornamented with entwined snakes and a garland of skulls; holding weapons in each of his four hands; and bells attached to his waist-band. The Ashtakam further goes on to describe how his frightful laughter shakes the entire creation; how he controls all the ghosts, ghouls and goblins; and how his fierce Tandava dance annihilates the evil; while also bestowing liberation upon devout souls. 1. The first stanza of the Kaalabhairava Ashtakam offers salutations to the Supreme Lord. Indra sits at his Lotus feet and serves him. Bhairava, who is venerated by Sage Narada and all the Yogis and Yogins of the world, is the King of the Devas. He adorns himself with snakes and the beautiful moon sits on his head. He appears in the form of a Digambara and is extremely kind and compassionate. 2. The second stanza offers salutations to the Supreme Ruler of Kashi, who is as brilliant as a million Suns. He, who is blue-throated and three-eyed, rescues his devotees from the bhavasagara (the ocean of worldly misery) and showers peace and prosperity upon them. He, the Imperishable One, supports the three worlds, which rotate around him. 3. The third stanza describes Bhairava as the Punisher of Evil. He holds a noose, club and spear in his hands. He is the Primordial Lord, whose body is dark and fearful. He is beyond disease and death. 4. The fourth stanza relates that he is the giver of all prosperity and lovingly liberates his devotees from worldly miseries and sins. 5. The fifth stanza offers salutations to Bhairava, who is ornamented with golden snakes and guards Dharma (righteousness), also leading his devotees toward the right path. He thus frees them from the unending cycle of Karma and eternal rebirth. 6. The sixth stanza relates how his Lotus feet are decked with sandals, studded with precious gems. He is the Eternal One and liberates his devotees from the fear of death. 7. The seventh stanza describes how Bhairava's terrible laughter makes the whole world tremble in fear. He is All-Powerful and bestows the eight Siddhis (powers) to sincere seekers. He wears a garland of skulls and, along with his consort, Maha Kalika, destroys the darkness of evil and sin. 8. The eighth and final stanza talks about Bhairava, the Lord of the Universe, as the ruler of ghosts and spirits. He showers happiness, peace, prosperity and glory on his devotees; also liberating the residents of Kasi from their sins; ever guiding them along the path of Dharma.